SOUTHWARD from Cowling lies FRINDS BURY, called in antient charters, Freondesbyri. It was likewise calledÆslingham, alias Frindsbury, from the manor of that name in this parish. THE PARISH is situated adjoining to the river Medway, partly towards the south, and wholly eastward, it is near five miles from north to south, though not more than half as much in breath, the surface of it is a continued hill and dale, though it is in general high ground, the soil is various, but the hills are mostly chalk, the dales a loamy soil, and towards Hoo a stiff clay, all for the most part sertile corn land. The village adjoins to the town of Stroud on the north side, seemingly as part of it, from whence the ground rises pretty high to the summit of the hill on which the church stands, on the opposite side of the river to the city of Rochester, from which it is a conspicuous object. At the north end of the street of Frindsbury the road branches off on the left hand to Cliff and Higham, and strait forward leads on to the Hundred of Hoo, on which, at a mile's distance, is Wainscott, and further on Chattenden, both mentioned hereafter; and at the north-west boundary of the parish, next to Cliff, the manor of Æslingham. The high London road runs along the southern part of this parish for near a mile westward, beyond the pond called St. Thomas's watering place, at a small distance from which, on the opposite side, there has been a shewy house, built within these few years by Mr. David Day, who named it Little Hermitage; a quarter of a mile southward of the road, but nearer to Stroud, is Read-court, beyond which this parish extends to the hamlet called the Three Crouches, where the three parishes of Frindbury, Higham and Cobham meet. The parish joins to the river Medway from Stroud, along the shore opposite to Chatham-dock, where, on the hill is a house called the Quarry-house, having a beautiful view over the river, the town, dock-yard, and adjoining country, and till it joins the parish of Hoo, about half a mile below Upnor-castle northward, all along between the river and the hill are large quantities of falt marshes, overflowed at every high tide. UPNOR-CASTLE is situated a small distance below Chatham-dock, on the opposite shore to it. It is a stone building, and was erected by queen Elizabeth, in her 3d year, for the desence of the river; but now, and indeed for many years past, there has not been a gun mounted in it for service, nor yet a platform. In the castle there is a magazine of powder, for the use of the navy, &c. for the security of which, here is an establishment of a governor, store-keeper, clerk of the cheque, a master-gunner, twelve other gunners, &c. There is likewise an officer's guard of soldiers, on detachment, which, with the rest of the forts on this river, excepting Sheerness, are under the command of the governor of Upnor-castle. One of these is the fort once called The Swamp, now The Birdsnest; but there has not been a gun mounted on it within remembrance, and the embrasures of earth have been long since mouldered away, and over-run with bushes and brambles. Another of them, called Cockhamwood fort, about a mile below on the same side the Medway, is yet to be seen; but with all the guns dismounted, and thrown by on the ground, the shot, &c. lying in the master-gunner's house just by, which, as well as the fort, is become very ruinous. The gift of the master-gunner's place, usually some invalid, is in the master-general of the ordnance; besides whom there is a quarter-gunner belonging to this fort. Hooness-fort, commonly called The Folly, is situated still lower down on the same side the river, where there are no guns mounted; but there is a master-gunner from Upnor-castle, who lives at it for a week at a time, a boat being allowed for the transporting each gunner, and his provisions, weekly from Upnor-castle for the service of the navy. As to Gillingham-castle, on the opposite side the river, an account of it will be given in its proper place. 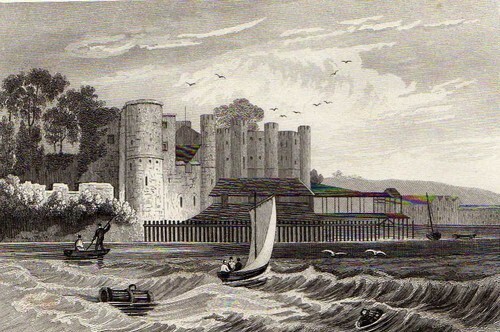 The south tower of Upnor-castle is allowed to the governor for his house, at which, on account of its unsitness for his reception, he never resides; but there are near the castle very good barracks, in which the gunners, soldiers, and officer commanding on the sport, are well accommodated. There is likewise a good storekeeper's house and gardens. The honorable general James Murray was appointed governor of Upnor-castle in 1775, in the room of major-general William Deane, deceased, and on his preferment, captain William Browne succeeded in 1778, and resigned in 1784, on being appointed lieutenantgovernor of Guernsey. Colonel Jeffry Amherst is the present governor. This parish ought antiently, with others in this neighbourhood, to have contributed to the repair of the first pier of Rochester-bridge. These estates were wrested from the church of Rochester in the troublesome times, which soon after followed by reason of the Danish wars. They came afterwards into the possession of Harold, and on the accession of William the Conqueror, were given by him among other estates to Odo, bishop of Baieux, his half brother, but archbishop Lanfranc recovered them again, in the solemn assembly held at Pinenden-health, in 1076, (fn. 3) and afterwards restored them to bishop Gundulph, and the church of St. Andrew; which gift was afterwards confirmed by archbishop Anselm, and by several of his successors, archbishops of Canterbury. The same bishop (of Rochester) holds Frandesberie It was taxed in the time of king Edward the Confessor at 10 sulings, and now at seven. The arable land is 15 carucates. In demesne there are 5 carucates, and 40 villeins, with 28 borderers, having 11 carucates. There is a church and 9 servants, and 1 mill of 12 shillings, and 40 acres of meadow. Wood for the pannage of 5 bogs. In the time of king Edward the Confessor, and afterwards, it was worth 8 pounds, and now 25 pounds. What Richard held in his lowy was worth 10 shillings. In Rochester the bishop had, and yet has, four and twenty plats of ground, which belong to Frandesberie and Borestale, his own manors. In the time of king Edward the Confessor, and afterwards, they were worth three pounds, now they are worth eight pounds, and yet they yield yearly eleven pounds, and thirteen shillings and four pence. Gundulph, bishop of Rochester, who was elected to that see in the time of the Conqueror, having after the example of archbishop Lanfranc, divided the revenues of his church between himself and the convent, (fn. 4) allotted the manor of Frindsbury, with its appendages, to the share of the monks, and it was confirmed to the church of Rochester, and the monks there, by king Henry I. king Stephen and king Henry II. and by several archbishops of Canterbury, and bishops of Rochester. On bishop Gilbert de Glanvill's coming to the see of Rochester in 1185, the bishop claimed this manor, with its appendages, among other premises given to them by bishop Gundulph, as belonging to the maintenance of his table, to which the monks were at last forced to submit. In consequence of which, though he wrested the advowson of the church of Frindsbury from them, yet they continued in possession of the manor, with its appendages, till the dissolution of the priory in the reign of king Henry VIII. In the 21st year of the same reign, upon a quo war ranto, the prior of Rochester claimed that he and his predecessors had in the manor of Frendesbery, &c. view of frank-pledge, and all matters belonging to it, from beyond memory; and that these liberties had been used without interruption. All which were allowed by the jury, &c.
That, as to pleas of the crown, a market, fair, gallows, and other liberties in this parish, he neither had, nor did ever claim them; and as to free-warren, he claimed it by grant of king Henry I. and said that he and his predecessors had the same in this and other pa rishes from the time of the said grant. But the jury sound, that neither he nor they had used it in this parish; therefore it was determined, that it should remain without the liberty of it. In the 15th year of king Edward I. this manor, with its appendages, Strode, Chetyndone, and Rede, was taxed at 24l. 6s. 8d. which latter was antiently called La Rede, and in the time of the Saxons Hreodham. On the dissolution of the priory of Rochester, in the 32d year of king Henry VIII. the manor of Frindsbury, with its appendages, the manors of Chatindon and Rede-court, and other premises in this parish, were surrendered, with the other possessions of it, into the king's hands, who presently after, in his 33d year, settled the manor of Frindsbury and Rede-court, with other premises in this parish, on his new-founded dean and chapter of Rochester, with whom the inheritance of them continue at this time. The lessee of the manor of Frindsbury is Philip Boghurst, esq. whose father of the same name erected the commodious and substantial court-lodge, situated near the church, and the lessee of the manor of Redecourt is Mr. John Boghurst, of Stroud. THE MANOR OF ÆSLINGHAM becoming part of the possessions of the church of Rochester, as beforementioned, was afterwards given by Gundulph, bishop of it, to Godfrey Talbot, but he reserved the whole tithes of it to the use of his monks. After which, this manor came into the family of St. Clere. John, bishop of Rochester, about the time of king Stephen, dedicated the chapel of Heslingham in honor of St. Peter, and endowed it with all liberties and customs, which it had from the time of bishop Gundulph, his predecessor, from the gifts made by Hugh de St. Clere and his family, and from the tithes of all his demesnes of the land, which he held of the fee of the bishop of Rochester, at the time the chapel was dedicated, from which lands the monks of the church of Rochester had yearly ten shillings, which were received by those who had the care of the manor of Frindsbury; and the mother church of the manor had likewise yearly thirty sheaves of wheat, thirty of barley, and thirty of oats, on account of the sepulture of the servants, who should die of the family of Hugh before-mentioned, or his heirs; but if the lord of Eselingham, his wife, his son, or his daughter should die, and be brought to the mother church of St. Andrew, although the profits of his chapel should be lessened by it, they should be buried there. And the bishop further granted, that the lord of Eselingham should freely have such chaplain as he thought fit in his house, to maintain at his own table, in like manner as it was known to be in the time of Gundulph, Ralph, Ernulf, and John, bishops of Rochester, and at the time of the dedication. In the reign of king Edward I. the same John de St. Clere held this manor, as one knight's fee, of the bishop of Rochester. (fn. 8) After which William de Brampton and Alicia de Eselyngham held it, and their heirs paid respective aid for it, as one knight's fee, in the 20th year of king Edward III. After which, though a layman, he was constituted the king's vicar-general, over all spiritualties under himself, and afterwards obtained from the king large and extensive grants of the lands late belonging to several religious houses. In the 31st year of the same reign, he procured his lands in this county to be disgavelled by act of parliament, and was further ad vanced to the dignity of earl of Essex, and quickly after knight of the garter, and lord high chamberlain of England. On his attainder the manor of Eslingham came to the crown, at which time it consisted of the mansion and buildings, with the demesne lands, a fishery on the river Medway, and the rectory of Islingham, with all tithes of corn, oblations and emoluments belonging to it, parcel of the manor; the fee of all which continued in the crown till queen Elizabeth granted it to Sir William Drury, of Norfolk, one of whose descendants, in the reign of king Charles I. alienated it to Henry Clerke, esq. serjeant at law, and recorder of Rochester; whose descendant, Gilbert Clerke, esq. of Derbyshire, alienated it to Mr. Thomas Best, of Chatham, whose son, Mawdistly Best, esq. died possessed of it in 1744, and by his will devised this manor to his second son, Mr. James Best, of Chatham, who died in 1782, and his eldest son, Thomas Best, esq. of Boxley, is the present owner of it. Another part of this estate was granted to the family of Cobham, of Cobham, in this neighbourhood, by the bishop of Rochester, to hold of him and his successors, and a third part was in the possession of the prior and convent of Rochester, as appears by the Book of Aid taken in the 20th year of king Edward III. at which time Sir John de Cobham, and the prior of Rochester, held half a knight's fee in Bromhege. Sir John de Cobham held his part of the bishop of Rochester as before-mentioned, and his descendant, John, lord Cobham, died possessed of it, by the name of the manor of Bromhei, in the 9th year of king Henry IV. since which I imagine this estate, which has for many years lost its antient name, has passed, in like manner as Cobham-hall, to the right honorable John, earl of Darnley, part of whose possessions in this parish it now remains. It appears by the Textus Roffensis, that there was once a chapel at this place, bishop Thomas de Woldham, by his will, in 1316, bequeathed to the poor of this chapel of Bromhei eight marcs. CHATTENDEN is an estate in this parish, which was once accounted an appendage to the manor of Frindsbury, and was as such given with it to the church of Rochester, in the time of the Saxon heptarchy, and re mained part of the possessions of the priory at its dissolution in the 32d year of king Henry VIII. when this manor, with the rest of the possessions of the priory was surrendered into the king's hands, who that year granted the manor of Chattenden, and its appurtenances, to Sir George Brooke, lord Cobham, since which it has descended in like manner as Cobham-hall, and the rest of the late duke of Richmond's estates, which in this parish consisted of 650 acres of land, to the right honorable John, earl of Darnley, the present owner of it. Luke de Hores, with the consent of his heirs, granted to the prior and convent of Rochester, to the increase of their manor of Frindsbury, land at Chetingdune, called the land of Eilric Bishop. In exchange for which they granted to him four acres of meadow in Stodbroc, adjoining in length against the ditch of Stroud-hospital. GODDINGTON, alias Waltons, but more properly Wattons, is an estate, lying partly in this parish, and partly in Stroud, which, as appears by the escheat rolls, was once reputed a manor. In the 20th year of king Edward III. Simon Godyngton paid aid for this manor as half a knight's fee, which Alan de Godyngton before held in Frindsbury and Stroud, of Jeffry de Scoland, and he of the earl of Leicester. This estate seems afterwards to have been divided, part of it comprehending the manor and part of the demesne lands lying in the parish of Strood, came into the possession of the priory of Rochester, as will be further mentioned under that parish, and the other part, which included the mansion, with part of the demesne lands situated near Frindsbury church, came afterwards into the family of Charles, one of whom, Robert Charles, had been possessed of land about Hilden, in Tunbridge, and was bailiff of the forest there to Robert de Clare, earl of Gloucester, in the reign of king Edward I. (fn. 16) In this name it continued down to Richard Charles, of Addington; who dying without male issue, in the 11th year of king Richard II. his two daughters, Alice, wife of William Snaith, descended from William de Snaith, chancellor of the exchequer in the reign of king Edward III. and Joane, wife of Richard Ormeskirk, became his coheirs. On the division of their inheritance, this estate became the property of William Snaith, who was in his wife's right possessor of Addington, and afterwards sheriff of Kent in the 9th year of king Henry IV. He died possessed of it in 1409, leaving Alice, his sole daughter and heir, married to Robert Watton, esq. who thenceforward resided at Addington, in her right. His descendants continued in possession of Goddington, holding it of the king, as of his duchy of Lancaster, by knights service, (fn. 17) till William Watton, esq. of Addington, in the reign of king Charles II. alienated it to Francis Barrell, esq. serjeant at law, and recorder of the city of Rochester, who bore for his arms, Ermine, on a chief sable three talbots heads erased of the field. He was elected to serve in parliament for the city of Rochester, in the 31st year of king Charles II. and dying in 1679, was buried in Rochester cathedral, as were his several descendants. By Anne Somer, his wife, who died in 1707, he left three sons; Francis his heir, of whom hereafter; Henry, who was chapter clerk to the dean and chapter of Rochester, and died in 1754 unmarried; and Edmund, who was prebendary of Rochester, &c. and died in 1765. Francis Barrell, esq. the son and heir, was of Rochester, which city he represented in the last parliament of king William's reign. He died in 1724, leaving by Anne Kitchell, his wife, who died before him in 1717, one son and heir, Francis, and four daughters; Anne, who died unmarried in 1780, and Catherine, who married Josiah Marshall, esq. Frances, wife of Mr. John Page, and Elizabeth, wife of the Rev. William Louth, prebendary of Winchester, and elder brother to the late bishop of London. Francis Barrell, esq. the son, married first, Anne, daughter of Thomas Pearse, esq. of Rochester, by whom he left two surviving daughters, who will be further mentioned hereafter; secondly, Frances, daughter of Thomas Bowdler, esq. who died in 1736; and thirdly, Frances, daughter and at length coheir of William Hanbury, esq. of Herefordshire, by whom only he had one son, Francis, who died before him, æt. 17, in 1755; so that his two daughters, by his first wife, who survived him, became his coheirs, viz. Anne, married to the Rev. Francis Dodsworth, vicar of Doddington, in this county, treasurer of Salisbury, and prebendary of York, &c. and Catherine, married to the Rev. Frederick Dodsworth, brother of the former. But this estate of Goddington was devised by the will of Mr. Serjeant Barrell, who died in 1679, to his second son, Mr. Henry Barrell, who dying unmarried in 1754, gave it by will to his nephew, Francis Barrell, esq. for his life, with remainder to his niece, Catherine, wife of Josiah Marshall, esq. and her heirs for ever. Her eldest son, the Rev. Edmund Marshall, vicar of Charing, sold it in 1780 to Mr. Thomas Ayres, who rebuilt the house, and dying in 1796, gave it by will to his niece, Mary Anne Hopkins, who sold it to George Gunning, esq. the present possessor of it. THE MANOR OF WAINSCOT, alias Parlabiens-yoke, was antiently the estate of a family of the name of Parlabien, who in the reign of king Edward II. had possessions both here and at Kedbrook by Charlton, in this county. Soon after which it came to the Colepepers, of Aylesford, in which family it continued till Sir Thomas Colepeper, about the end of queen Elizabeth's reign, alienated it to Edward Randolph, whose heir sold it to Somers, of St. Margaret's, Rochester, who was descended from William Somer, chancellor of the exchequer in the reign of king Henry VI. and possessed much land in the hundred of Hoo. They bore for their arms, Vert, a fess dancette ermine. His son, in the reign of king Charles I. alienated it to Mr. Robinson, (fn. 18) of Rochester, whence it passed by sale to Mr. Henry Golding, of Upper Halling, whose heirs sold this manor to Francis Brooke, esq. of Town Malling, who died in 1782, and by his will gave it to his nephew Joseph Brooke, esq. of Town Malling, and he sold it to the Rev. Edward Holme, as he did to Mr. John Boghurst, the present owner of it. There is a court-leet and court-baron held for this manor. There was an estate in this parish called THORNDEN, or Thornindune, which was held of the manor of Frindsbury, by the wife of Robert Latimer. The monks of St. Andrew's claimed the reversion of this estate at her death, but she affirmed that the inheritance of it belonged to her kindred. However, before her death, she gave it up, with all that she had upon it, to the monks, to be possessed by them for ever, placing at the same time the grant of it from bishop Gundulph, on the altar of St. Andrew, for which the monks gave her sixty shillings, and promised her besides, food and cloathing so long as she should live, food from the celerer, as much as for one monk, and one dish of flesh four days in the week; and cloathing from the chamberlain, honorable, such as became her age and person, and to such man and maid servant, as she should have, such food as the rest of the servants of the church had; and further, they gave her twenty shillings yearly to pay their wages, and cloath them, and procure other necessaries for herself, and when she died the convent agreed, that they would bury her, and keep her anniversary yearly. ROBERT GUNSLEY, and the PARISH OF FRINDSBURY, jointly purchased by deed in 1632, a mill and twenty-seven acres of land in Hoo, from the yearly produce of which the yearly sum of 1l. 13s. to be applied to the repairs of the church, the remainder to the poor in bread, vested in the minister and overseers, of the annual produce of 5l. 10s. PHILIP STAINES gave by will, to be laid out in bread, lands vested as above, and of the annual produce of 3l. 2s. JOHN WOODGGRENE gave, to be laid out in bread, lands and tenements, vested as above, and of the annual produce of 5l. 10s. but subject to repairs. RICHARD WATSON gave by will, to be divided among twelve of the poorest persons in the parish, a tenement, vested as above, of the annual produce of 9l. subject to repairs. A PERSON UNKNOWN, gave seven acres of land in this parish, the rent accruing from which has always been expended in repairing the church. BOWHAM PENNISTONE gave an acre of land near Upnor, towards the same use. THE RENT of the Green, containing one acre, was given to repair the church. FRINDSBURY is within the ECCLESIASTICAL JURISDICTION of the diocese and deanry of Rochester. At the time of Gundulph's coming to the see of Rochester, anno 1075, there was no church here, but there was not long afterwards one built of stone by Paulinus, sacrist of the church of Rochester, (fn. 19) who ornamented it with books, vestments, &c.
The present church of Frindsbury, which however bears no marks of any deep antiquity, is dedicated to All Saints. It consists of two isles and a chancel, with a spire steeple at the west end, in which is a peal of five bells and a small one. Richard Young, bishop of Rochester, in king Henry the Vth's reign, caused several windows to be made in this church, and when Lambarde wrote his perambulation, the picture of this prelate was remaining in one of the windows. The font is a curious piece of gothic architecture. John, bishop of Rochester, in the reign of king Henry II. gave this church, together with the chapel of Strodes belonging to it, and all lands and tithes, to the church of St. Andrew, in Rochester, towards the finding of lights there, and on condition that the sacrists (fn. 21) of it should give after his death, for the good of his soul, yearly, on the day of his anniversary, one mark of silver; to buy bread to be distributed to the poor, which was confirmed by pope Celestine II. with licence to appropriate it to the use of their almonry. Walter, bishop of Rochester, soon afterwards, in the reign of king Henry II. confirmed this grant, together with the free disposition of the church, and the presentation of the vicarage, but bishop Gilbert de Glanvill, who came to the see in 1185, finding the revenues of his bishopric impoverished by these gifts of his predecessors to the priory, re-assumed the possession of many of them, and though he left the monks in possession of the appropriation of this church, yet he annexed the advowson of the vicarage to his see again, and in 1193, the bishop, with the consent of William, archdeacon of Rochester, then rector of this church of Frindsbury, made Strood an independent parochial district. Bishop Lawrence de St. Martin, on account of his great expences and the slenderness of his income, in 1256, obtained from the monks the appropriation, saving to them an annual pension of one mark from it, (now paid to the dean and chapter) and all tithes within the limits of it, before that time possessed by them. Bishop Gundulph, in 1091, with the assent of archbishop Anselm, had granted to the monks of St. Andrew's, the tithes arising, as well from the food of their cattle, as from their agriculture, within the manor of Frindsbury, and others within his diocese, to the use of their refectory; which gift was confirmed by archbishop Theobald, by Ralph Prior, and the convent of Canterbury, by Walter Gilbert, and Henry, bishops of Rochester, &c. which latter further granted to them the small tithes, together with the other tithes arising from their manors and demesnes in Frindsbury, and their other manors within his diocese, according to former custom. All which was confirmed by Richard, bishop of Rochester, in 1280, who at the same time, at the instance of the prior and convent of Rochester, made enquiry, by a solemn inquisition, in what manner the monks used to retain tithes in their manors, and in what manner they used to impart them to the parish churches; when it was found, that the parish church of Frindsbury was formerly endowed, in the name of a portion of tithes, in land called Nelesfelde, parcel of the demesne land of the manor of Frindsbury, which belonged to that church; and that they gave yearly, in the time of harvest, to the church in the name of tithe, one acre of wheat, one acre of barley, and one acre of oats of middle corn; but of wool, or the produce of the dairy, of other small tithes, the church did not, nor had used to take any thing. But in the grange of Chatingdone, which was a member of the manor of Frindsbury, the church took only the whole tithe of sheaves. At La Rede, which was a member of it likewise, the almoner of the priory took, as had been used of antient time, only the whole tithe of sheaves But that the church of Frindsbury did not, nor had used to take any thing there. And of other small tithes, as well as of the mills, and hay in the manor of Frindsbury, and in their other manors, the parish church did not, nor ever used to take any thing; and he decreed, that the parish church of Frindsbury should be content with the endowment of the aforesaid land, called Nelesfelde, with which it remained endowed of antient time of the demesne land of the manor, in the name of tithes, and of the three acres of corn in the time of harvest, to be taken as before-mentioned, and in the tithes of sheaves in Chatingdone only; and that the monks should have and retain for ever all other tithes, both great and small, by whatever names they were called, in all their manors and places within his diocese, the tithes of sheaves, &c. in each of them, as were particularly mentioned in his instrument, only excepted. All which was confirmed to them, as well as the former grants of bishops Walter, Gilbert, and Henry, by John, archbishop of Canterbury, by inspeximus, in the year 1281. (fn. 23) In the 15th year of Edward I. this church was valued at sixty marcs, and the vicarage at one hundred shillings. In the 33d year of king Edward III. the church, with the chapel of Stroud, was taxed at sixty marcs. And in a subsequent valuation, the church of Frindsbury was valued at one hundred marcs. In the valuation of church livings, &c. taken in 1650, it was returned, that here was a vicarage worth forty pounds per annum, but then sequestered; and also one chapel, which belonged to the manor of Islingham, and was antiently endowed with the tithes of eight score acres of land, which paid only to the parson of the parish yearly, three copp of wheat, three copp of barley, and three copp of oats, and to the minister 13s. 4d. per annum, and that the said chapel was then employed as a barn. This vicarage is valued in the king's books at 10l. 3s. 11 1/2d. and the yearly tenths at 1l. 4 3/4d. The parsonage of Frindsbury and advowson of the vicarage, still continue part of the possessions of the bishopric of Rochester. The endowment of the vicarage is not extant, but the vicar by usage, is entitled to all tithes, except those of corn and grain. The vicarage house is situated at an inconvenient distance from the church, and not in a very healthy situation, there are fifteen acres of glebe land. The register does not begin till 1669. GOTCELINE DE HÆNHERSTE became a monk in the priory of St. Andrew in Rochester, and gave to it on that account, the half of his tithe of his land there, and in Frindsbury. (fn. 25) The portion of tithes seems to have remained part of the possessions of the priory, at its dissolution in the 32d year of king Henry VIII. who granted in next year, by his dotation charter, to his new erected dean and chapter of Rochester, with whom it now continues.